Goals are part of every aspect of business/life and provide a sense of direction, motivationInterpersonal IntelligenceInterpersonal intelligence refers to the ability of a person to relate well with people and manage relationships. It enables people to understand the needs and motivations of those around them, which helps strengthen their overall influence. People with interpersonal intelligence, a clear focusLeading by ExampleLeadership is a process in which an individual influences the behavior and attitudes of other people. Leading by example helps other people see what lies, and clarify importance. By setting goals for yourself, you are providing yourself with a target to aim for. A SMART goal is used to help guide goal setting. 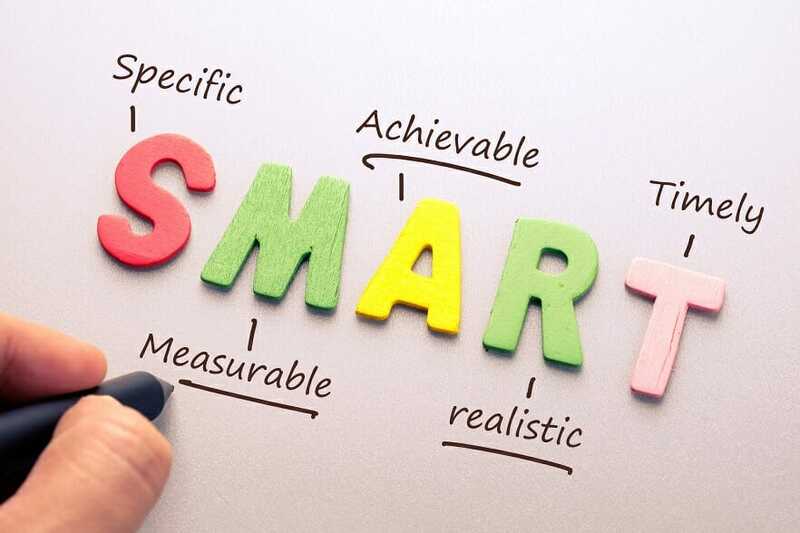 SMART is an acronym that stands for Specific, Measurable, Achievable, Realistic, and Timely. Therefore, a SMART goal incorporates all of these criteria to help focus your efforts and increase the chances of achieving that goal. Timely: With a clearly defined timeline, including a starting date and a target date. The purpose is to create urgency. Who: Who is involved in this goal? Where: Where is this goal to be achieved? When: When do I want to achieve this goal? Why: Why do I want to achieve this goal? How do I know if I have reached my goal? What is my indicator of progress? For example, building on the specific goal above: I want to obtain a gym membership at my local community center and work out four days a week to be healthier. Every week, I will aim to lose one pound of body fat. Do I have the resources and capabilities to achieve the goal? If not, what am I missing? Have others done it successfully before? Is the goal realistic and within reach? Is the goal reachable given the time and resources? Are you able to commit to achieving the goal? By when do you want to achieve your goal? For example, building on the goal above: On August 1, I will obtain a gym membership at my local community center. In order to be healthier, I will work out four days a week. Every week, I will aim to lose one pound of body fat. By the end of August, I will have realized my goal if I lose four pounds of fat over the course of the month. Often, individuals or businesses will set themselves up for failure by setting general and unrealistic goals such as “I want to be the best at X.” This goal is vague with no sense of direction. SMART goals set you up for success by making it specific, measurable, achievable, realistic, and timely. The SMART method helps push you further, gives you a sense of direction, and helps you organize and reach your goals. Thank you for reading this guide to SMART Goal-setting in business. Below are additional resources from CFI, the global provider of the Financial Modeling & Valuation Analyst (FMVA) designation.